From before the time when people could read or write, events and stories were related by word of mouth, generation to generation. 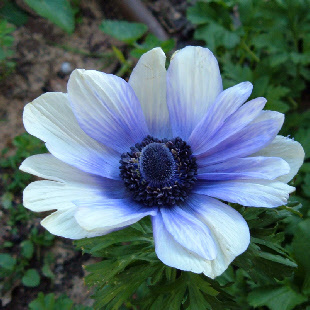 Since the story of the anemone was told differently each time, there were many variations, but they all came down to this one. When the goddess of the flowers, Flora, took into her court of followers the pretty nymph Na'aman, she caught the eye of of many a courtesan... yes, even Boreas the Northwind, and Zephyr the Westwind. Even the husband of Flora fell for the lovely girl that looked so desirable in her new court attire. Boreas' notice of the girl had started to become a bit more pronounced, however. Of course, when Flora found out, she was furious and sent Na'anan away from her court and reprimanded Zephyr even though all he had tried to do was protect Na'anan from his icy brother, Boreas. Alas, the girl fled in embarrassment, running as fast as she could into the undergrowth of the deep wood where even the wind could not follow her. Exhausted and cold, her clothing ripped, she prepared to die there. That is when Arthemis, the goddess of beauty and love found her at the point of death. Arthemis had been in mourning ever since her love Adonis had been killed by a wild boar, but now was wondering at the sight of such unknown beauty on her often cold and mis-adventurous hikes through the wilderness. Warmed by the stillness of the dense growth, she pitied the poor girl and vowed to help her forever. Na'anan became a flower, so she would always have beautiful clothing. Arthemis bestowed on her a poison, one which affects the respiratory organs, so that anything- even the wind- wanting to harm her would run out of breath. Lastly, Arthemis gave Na'anan the protection of a furry coat against the cold. And, that is how we find the anemone... on high mountain peaks, the cold wind still after her, the pretty skirt still blown all around. But we know she is protected by Arthemis herself, covered with soft hairs and her babies clustered in her towhead. In the cold alpine her fragile flower drops off all too quickly, but resistant as ever, the towhead babies soon peer at us cheekily from somewhere under that densely packed hair. The strange thing is... only in the forest do we find her without all the hair... the dark woods where she at last found safety.